I suppose it would be rather hard to believe that I don't actually enjoy cake, seeing as I churn them out the kitchen at quite a speed. 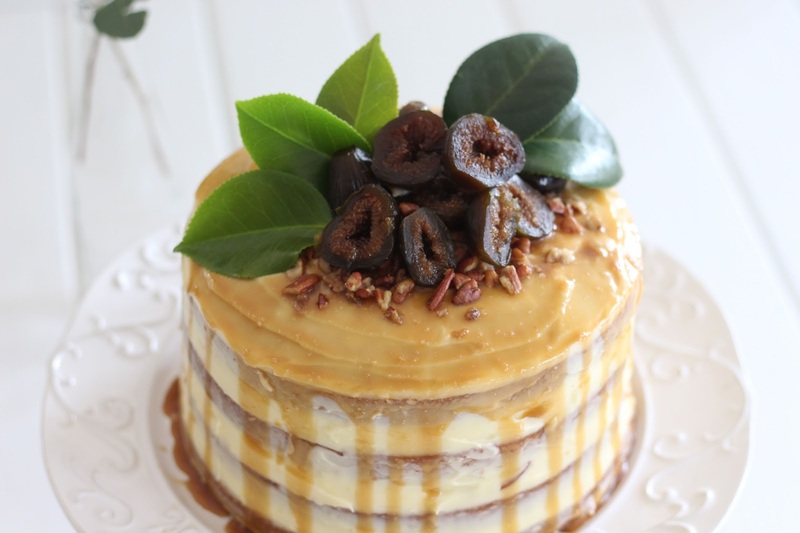 I just really love creating and combining ideas that come out looking and tasting like this decadent spiced cake with figs. 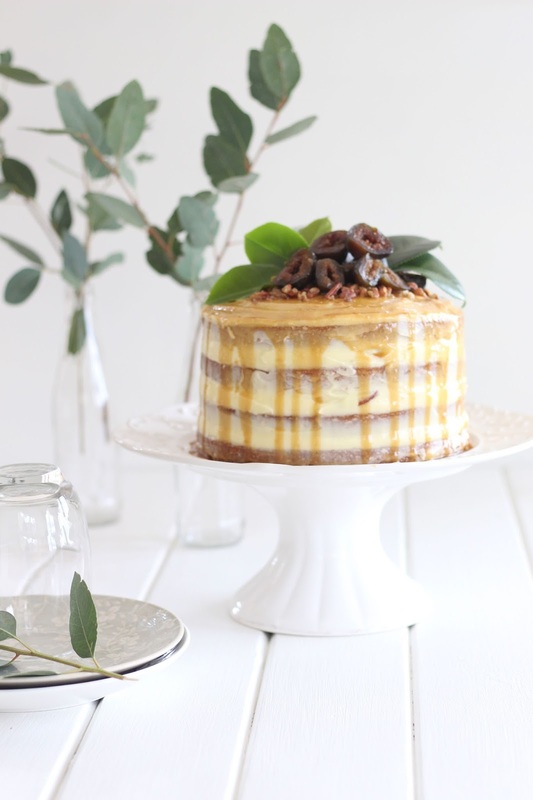 It has taken me awhile to get this wonder of a cake up on the blog, but here it is folks. I loved how the spices blended so well together and gave the cake a subtle yet really great taste and texture. I couldn't find fresh figs so I opted for a green fig preserve. However if you had fresh figs in your kitchen they would work just as nicely. 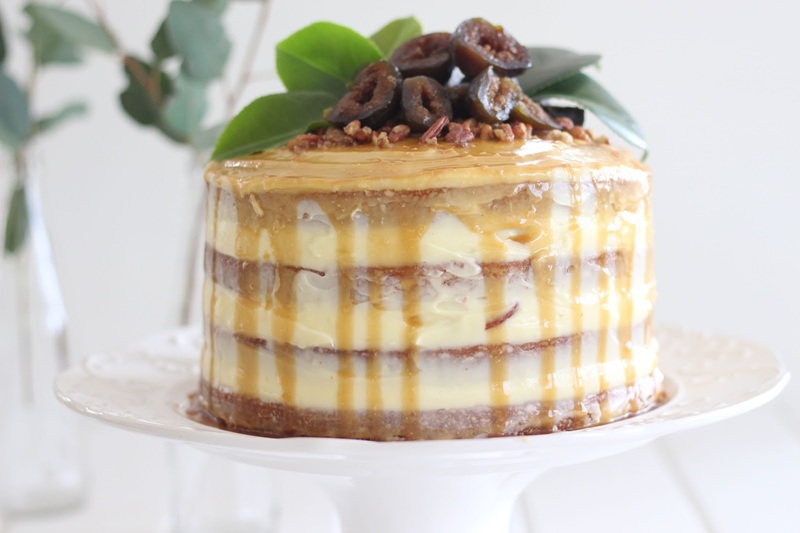 I filled the layers with candied pecans, which were so yummy on their own but when combined with the warm spices and creamy cream cheese frosting, it all paired so well together. 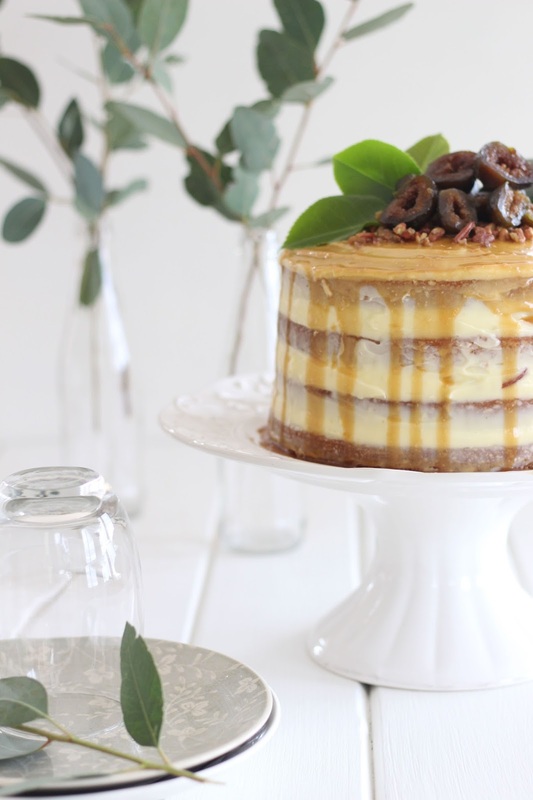 And the drizzled caramel was seriously the cherry on top of this already lovely cake. I'm really a creature of habit so if you look carefully enough you'll see this cake recipe is pretty much the same as my strawberry naked cake, other than the spices and a little maple syrup. But hey why ruin a good thing right? 1. Preheat oven to 170* degrees. Grease two 20cm cake tins and lay wax paper on the bases. 2. Beat the butter and sugar in a freestanding mixture until light in colour and creamy. Add the egg and mix in. 3. Sieve the flour and add into the mixture alternately with the milk. Add the salt, vanilla extract, maple syrup and spices. Lastly fold in the baking powder. 4. Divide the batter into the tins and bake for 20 to 25 minutes. Insert a cake tester and if it comes out clear, the cakes are done. The cake texture is quite crumbly so allow the cakes to cool completely before taking them out the tins. 5. Repeat all the steps with the second batch of batter. 1. Beat the butter in a freestanding mixture until creamy. Sift the icing sugar and mix into the butter. 2. Scrape down the sides of the mixture in the bowl. And then add the cold cream cheese and beat in until well incorporated. 1. Melt the butter in a saucepan. Add the pecans and toss until coated in butter. Toast for a little while. 2. Add the sugar and stir into the nuts. Stir until caramelised. Add the cinnamon and vanilla. 4. Turn out onto a tray with wax paper and allow to cool and harden. 1. Place the butter and sugar in a small saucepan and place over medium to low heat. Stir until sugar begins to dissolve. The mixture will thicken and bubble. 2. Add the vanilla extract and salt and stir well. Stir in the cream, if you need a little more cream add it in slowly as too much liquid will not work for drizzling. Make the caramel right at the end as you don't want it to harden before drizzling it on. 1. Begin by placing your first layer of cake on your chosen cake stand. I like to place some wax paper under the cake as it keeps the icing from dripping all over the plate. 2. Add a spoonful of frosting onto the first cake and spread evenly over the cake. Sprinkle some of the candied nuts over the frosting. 3. Repeat with the remaining layers. 4. Use a large offset spatula to frost the entire cake with a thin 'crumb coat'. Fill any patches or holes with remaining icing. 5. Drizzle the caramel over the cake using a spoon, start drizzling around the edges first to get that drip effect. 6. 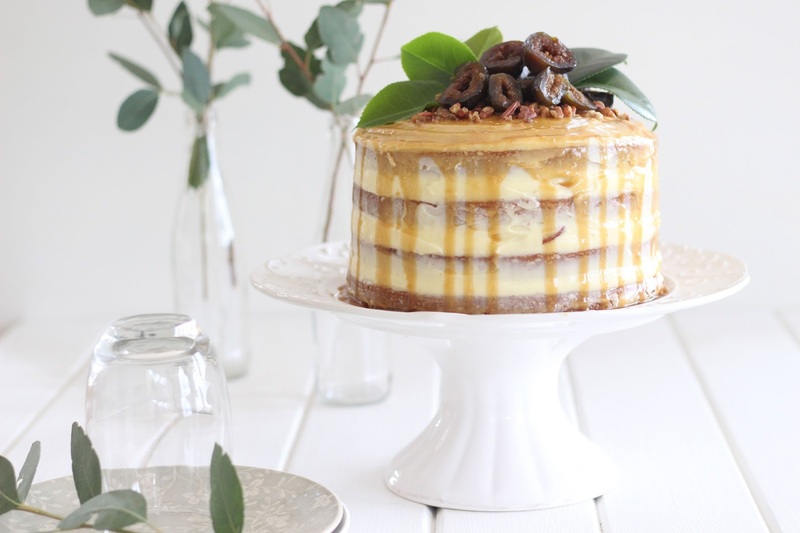 Decorate the top of the cake with the rest of the candied pecans. 7. Rinse the green figs under a tap to get rid of any excess syrup. Garnish the top of the cake with the figs, using them either whole or slicing them. For extra garnish use some foliage if you wish.